Kick off your visit on the 15th (Fri): admire the natural beauty at Jardim Botânico do Rio de Janeiro, kick back and relax at Praia de Ipanema, then enjoy the sand and surf at Pedra do Arpoador, and finally kick back and relax at Copacabana Beach. Here are some ideas for day two: enjoy the sand and surf at Vermelha Beach, then appreciate the history behind Corcovado Christ the Redeemer, and then take a stroll through Santa Teresa. To see reviews, more things to do, other places to visit, and more tourist information, you can read our Rio de Janeiro vacation builder app . The Route module shows you travel options from your home to Rio de Janeiro. In February, plan for daily highs up to 38°C, and evening lows to 28°C. Wrap up your sightseeing on the 16th (Sat) early enough to travel to Fernando de Noronha. On the 17th (Sun), kick back and relax at Praia do Sueste, stroll through Baia do Sancho, and then take in panoramic vistas at Forte Sao Pedro do Boldro. On the 18th (Mon), you'll have a packed day of sightseeing: head outdoors with Baia dos Porcos, get a sense of history and politics at Palacio de Sao Miguel, and then take in the architecture and atmosphere at Capela de Sao Pedro. To see traveler tips, ratings, other places to visit, and more tourist information, read our Fernando de Noronha trip planning site . Traveling by flight from Rio de Janeiro to Fernando de Noronha takes 8 hours. Traveling from Rio de Janeiro to Fernando de Noronha, you'll lose 1 hour due to the time zone difference. 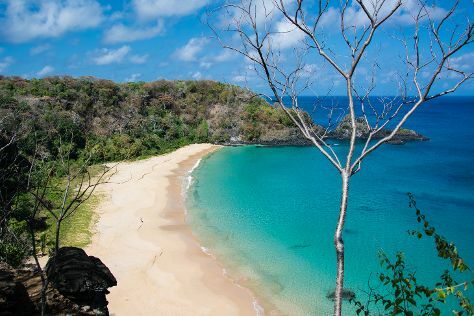 In February, daytime highs in Fernando de Noronha are 35°C, while nighttime lows are 29°C. Finish up your sightseeing early on the 18th (Mon) so you can travel back home.